So far Naomi Crago has created 359 entries. stood, and that portion of the wall nearest to King-street, and at the rear of the building, looked like some drunken thing of bricks and mortar”. Following the disaster, the façade was replaced and rented out to Hobsons Limited, furniture makers. Another furniture making company, J Mansfield and Son, purchased the property in 1932. In 1988 the ground level of the building was converted into a convenience store. It is still operated as a 7-11 today. The original floorboards are likely to still be present, covered over with post-war concrete. A loading bay at the rear of the building contains an original lift and wooden stairs. (1902, Dec 21), “Marcus Clark”, Sunday Times (Sydney, NSW : 1895 – 1930), p. 14. Retrieved from Trove. (1924, Jan 15), “City Fire”. The Sydney Morning Herald (NSW : 1842 – 1954), p. 9. Retrieved from Trove. (1924, Jan 18), “Big Newtown Fire”. The Scone Advocate (NSW : 1887 – 1954), p. 4. Retrieved from Trove. Historical Atlas of Sydney. 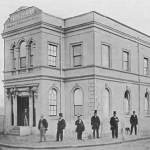 The Bank Hotel on King Street Newtown dates back to 1880 at which time Ralph Mason was the proprietor. The Bank Hotel was a popular location during this period for community and group meetings. 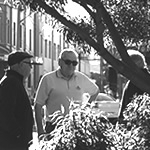 Groups such as the Newtown Stonemasons and the Newtown Football Club would regularly meet at the Bank Hotel. In front of the Bank Hotel was where all outward trams diverged off to St. Peters, Enmore and other places making it one of the busiest parts of Newtown. During this period there was no shelter from heavy rain or fierce heat for waiting tram passengers so they would often seek shelter under the verandah of the Bank Hotel. 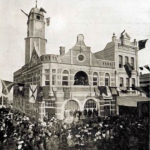 In 1912 Newtown celebrated the Jubilee of the incorporation of the Municipality on December 12th 1862, there was a week of Jubilee activities that saw the Bank Hotel decorated along with most of King Street. In 1913 the Hotel became known as ‘Croads Bank Hotel’ when Mr. Martyn Hyland Croad became the owner. Applications for liquor licences, at the time, were required to be accompanied by a plan or sketch of the premises to be submitted to NSW Licensing Courts in the Sydney Metropolitan Area for approval. As such, during Mr. Croad’s ownership of the Bank Hotel, architect George A Marsh drew up a plan of the premises to be submitted to the NSW Licensing Courts in May 1916, the application was approved in June 1916. (A portion of the ground floor plan is available through the NSW State Archives and Records, record series Plans of Licensed Premises: Hotel Plans). Mr Croad, passed away in 1916, leaving a widow, two sons and a daughter. As executor of Mr. Croad’s will his widow Isabella Sophia Croad transferred the licence to herself in 1917 before transferring the Bank Hotel to John Scott in 1918. The Bank Hotel had a long list of owners and proprietors over the coming years including George Lilya, Henry Reid, Thomas Dowd, W. Meadows, Oswald Kennedy, James Heaney and H. Donnison. The hotel was remodelled in the 1930s. In 1952 Mr. Francis William Metcalf became the licencee of the hotel and it became known as Metcalf’s Bank Hotel. On the 4th of June 2010 an electrical fire occurred in the basement of the Bank Hotel, fortunately the fire was contained and extinguished before any damage was done to the historic hotel. The Bank Hotel still operates and remains a popular spot on King Street. (1884, Sep 6), “Newtown and St. Peters Roads”, Balmain Observer and Western Suburbs Advertiser (NSW: 1884-1907), p. 3. Retrieved from Trove. (1886, Feb 3), “Newtown Stonemasons”, Evening News (Sydney, NSW: 1869-1931), p. 3. Retrieved from Trove. (1895, Mar 30), “Newtown Club”, The Daily Telegraph (Sydney, NSW: 1883-1923), p. 11. Retrieved from Trove. (1912, Dec 9), “The Jubilee of Newtown”, Sydney Morning Herald (NSW: 1842-1954), p. 8. Retrieved from Trove. (1916, Nov 4), “The Death of Mr. M. Croad”, The Wingham Chronicle and Manning River Observer (NSW: 1898-1954), p. 4. Retrieved from Trove. (1917, Jan 26), “Licensing Court”, Sydney Morning Herald (NSW: 1842-1954), p. 3. Retrieved from Trove. (1918, Feb 8), “Hotel Transfers”, The Sydney Morning Herald (NSW: 1842-1954), p. 4. Retrieved from Trove. (1927, Jul 16), “Obituary”, The Shoalhaven News and South Coast Districts Advertiser (NSW: 1891-1937), p. 3. Retrieved from Trove. (1952, May 27), “Cellist to Run City Hotel”, Sydney Morning Herald (NSW: 1842-1954), p. 3. Retrieved from Trove. (2010, Jun 4), “Fire crews battle fire at historic hotel”, Australian Broadcasting Corporation. Flynn, C. (1994) King Street in the Twentieth century 1900-1950. Marrickville Council, Library Services Division.